Do People REALLY Click on the Links in Your Blog Posts? Internal linking is an oft-cited inbound marketing best practice. Why? A couple reasons. First, there’s the SEO value you get from it: If you want to boost a page’s credibility, linking to it from other pages on your site should help Google understand that particular page is important. But there’s also this idea that when you link to other pages in your blog posts, you help move people through your site, giving them opportunities to read more content and perhaps even convert on a landing page. I totally buy that first one. I’ve never been totally sold on the second. That’s why I decided to see just how much internal linking actually prompts people to click on links within our blog posts. I mean, is all this time I’m spending hyperlinking stuff actually helping any readers out? Turns out, sometimes it does … and sometimes it’s kind of a wasted effort. Using a free click-tracking product — I used bit.ly, but any of them work just fine if you want to try this out on your own site — I tracked the click results of a few links the first 24 hours after I published a blog post on our site. I did this for a handful of blog posts, and here’s what I found readers clicked on (and didn’t click on all that much) in a few different, and very common, blogging scenarios! I thought I’d start out on a boring note, because that’s always a good idea when creating content. I wanted to see how many people were clicking on your regular, run of the mill anchor text — nothing special about it (not part of an image, not super long, not prescriptive … all the kinds of things we’ll test later in this post). Just, you know, a baseline we could use as a frame of reference for our other tests. Here’s what I found. The orange anchor text you see below — not the big bold heading, the smaller stuff — received 36 clicks. The anchor text “compelling success stories” received even less, with 20 clicks. Even less still, “dynamic, or “smart,” CTAs” only got 10 clicks! Maybe readers are dropping off as we get further down the post? Maybe not — this anchor text about our ebooks received 25 clicks. A bit more, but nothing to write home about. And we got even more clicks when we wrote out the entire title of one of our blog posts that we linked to in this last example — 46 clicks. Still, not a ton, though. Some of you love it, some of you love to hate it. 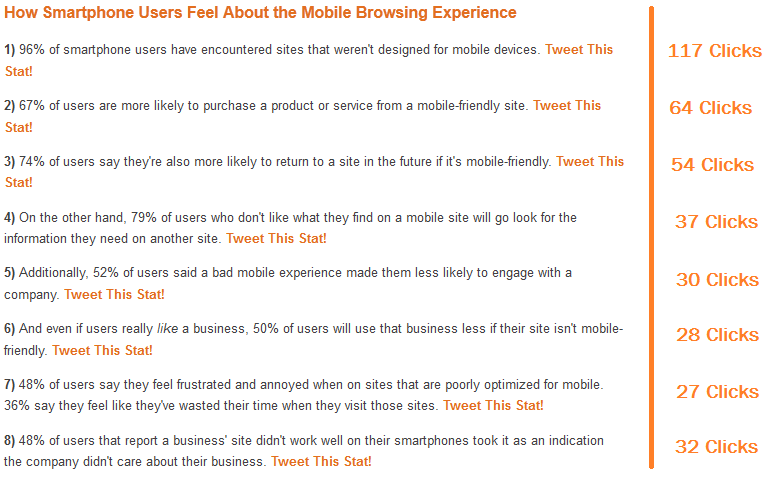 “Tweet This Stat!” refers to the hyperlinked text we often put at the end of a stat in a blog post. The theory behind it is that people might like to share the stat on Twitter — which, conveniently, is usually already under 140 characters. In fact, we found out that over 24 hours, 110 people clicked the link that appears in the tweets themselves. In other words, when someone decides to tweet out a stat from our blog post, 110 people on Twitter saw that tweet and were interested enough to click through to read the blog post. So those links are helping our blog posts reach a wider audience. But I also wanted to find out something else with these “Tweet This Stat!” links — does anyone every actually tweet the stat? Well, in 24 hours, 624 people clicked the “Tweet This Stat!” links within the blog post. That means our conversion rate from tweet to click is 5.67%.Not too bad! This doesn’t surprise me — we’ve all known for some time most people don’t read blog posts to the end. So I guess the moral of the story here is to put your juiciest stats up front; it might keep people reading for longer, and it’s the content that’s most likely to get shared socially. Piggybacking off this idea that people don’t read that much of your blog post, I decided to see whether the placement of an internal link in a blog post had any effect on clicks. So I put one link in the introduction of a post, and another several paragraphs later in the post — they both had similar anchor text, too, to try to control for compelling anchor text being the impetus for clickthroughs. So, what did people click? Over the first 24 hours, the internal link in the post’s introduction received 145 clicks, while the link a few paragraphs down received 67 clicks. Now, you could argue that the latter is due to the anchor text being similar … people already converted on the first link, right? That’s plausible, yes, but if I was a bettin’ lady (I am, Craps is my game), I’d say it’s due to a drop off in readership the further down the post you go. The other thing about many internal links is that people are really used to seeing them — so much so that readers just gloss right over them without stopping to click. So I thought maybe using longer anchor text could make internal links more visible, and they would garner more clicks. Here’s what I found when I compared the performance of a longer link with that of a shorter link. Here’s some looooong anchor text I used, which after 24 hours, garnered 112 clicks. Not bad — especially considering how those shorter links performed in our first experiment (those clicks were all in the low double digits, if you recall). But was it just that it was prescriptive hyperlink text? In other words, this anchor text instructs the reader, saying “reference this blog post.” That’s more compelling than just … long anchor text … because it not only catches your eye, but engages you by telling you what to do. So we tested some non-prescriptive but still long anchor text. It ended up getting 203 clicks. Hmmm … inconclusive on the prescriptive stuff, but it does seem like longer anchor text is getting more clicks than the shorter anchor text. Let’s try one more action-oriented internal link, shall we? It got 185 clicks in 24 hours! That’s not too bad at all. I think it also helped that it was in the introduction of the post — so more readers were still around — and, perhaps, that it was bold, so it caught reader’s eyes better. All in all, I think longer anchor text helps get more clicks that shorter anchor text, and making it more action-oriented — a best practice to improve conversion rates in most areas of your marketing — certainly doesn’t hurt. 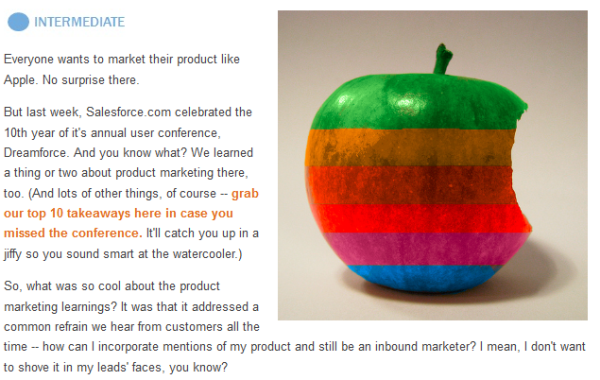 Finally, what happens when you hyperlink the images in your blog posts? Does anyone actually click those things? Yeah … turns out some people do! First, I wanted to see if anyone clicks the image at the top of our blog posts — the cute ones we put in all of our posts that are really just there to please the eye. In a recent post I tried this with, it actually got 34 clicks. Maybe it’s because the image was so lovable. But what about the other images in a post? This particular post had several screenshots in it, and similar to the “Tweet This Stat!” phenomenon, the number of clicks decreased the further down the post you went. The first image received 81 clicks — up from the top image — and the clicks decreased from there to 64, 36, and 26. So, Do People Click Links in Your Blog Posts? Yes! Some more than others. I think internal linking is important to do regardless of whether readers are clicking those links, but hey, if you can game the results in favor of some clicks, that’s pretty groovy. This means if you can make your links jump off the page — by making them long, bold, and frankly, not too far down the post — they’re more like to get clicked. And if your link is relevant to the reader, meaning it’s really clear what the content on the other side of that link is, and that it’s going to be great, your links might get more clicks. I’m going to keep playing around with this stuff to see if I can figure out some method to the linking madness; I hope you do the same!